Open your wallets. Wide. 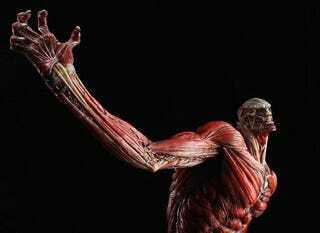 That is, if you plan on buying this Attack on Titan statue. Produced by GoodSmile Company and designed by famed figure sculptor Takayuki Takeya, this 19-inch statue of the Colossal Titan will be released in March 2015 and is limited to 500 numbered pieces. It's not cheap! GoodSmile is listing the price as 64,815 yen plus tax, which translates to $624 plus tax—about $675. But if you look at this limited edition statue's detail, maybe you can see why.